We are able to put artwork or logos on most of our products. 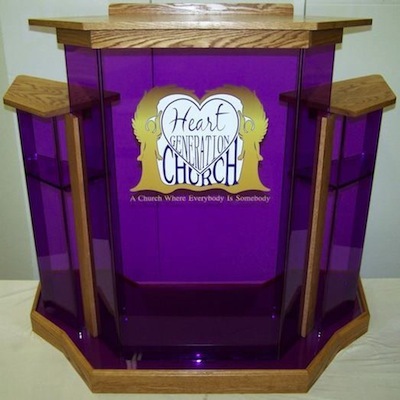 Common artwork options include your church or company logo on podiums; "Offering Table," "This Do In Remembrance Of Me," or an etching of the last supper on tables; "Tithes," "Offering," "Tithes and Offering," "Building Fund," or "Prayer Request" on collection boxes. Custom artwork options are available. Please contact us with questions. If you already have artwork, please e-mail your artwork to Artwork@Curtisproductsgroup.com. Please e-mail your artwork as an e-mail attachment. Our artwork department will then prepare a proof for your review and approval. Our artwork department will create artwork for you for a small additional fee. Please review the following information to make sure your artwork meets requirements. 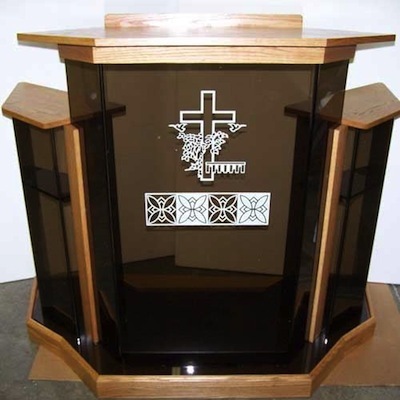 If you have any questions, please contact our artwork department at tom@customengravinginc.com. We prefer to work with vector based art files like .eps, .cdr or .ai files created in programs like CorelDRAW or Adobe Illustrator without any embedded images. For best results, provide vector art without hidden lines whenever possible. Please submit artwork in one of the following formats. Convert your text to curves. Once the text is converted we will not be able to change the text. We can import vector .eps files (Bitmap .eps files will not work). In order to do so, you need to convert text to outlines and save or export as a .eps file. We can import Adobe Illustrator files into CorelDRAW for our use. In order to do so you need to convert text to outlines and save as a .ai file. The image must be at least the same size or larger than the final artwork product. Note: Files saved in this format are limited to how they can be manipulated.